In this experiment, students will develop an understanding of bacterial transformation by plasmid DNA by introducing an opportunity to observe an acquired phenotypic trait of the transformed bacterial cells. 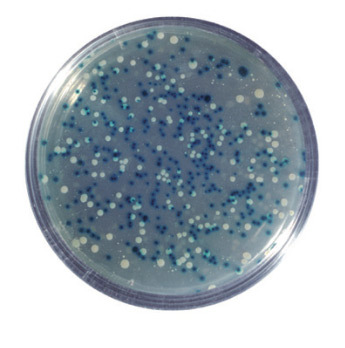 The presence of blue bacterial colonies visually demonstrates the expression of a specific gene for the Lac+ phenotype. BactoBeads™, plasmid DNA, buffer, media, ampicillin, X-Gal, agar, petri dishes, sterile pipettes, loops and microtubes. Automatic micropipette (5-50µl) and tips, two water baths (37˚C and 42˚C), incubation oven, thermometer, pipette pumps or bulbs, ice, marking pens, bunsen burner, hot plate or microwave oven, and hot gloves. In this experiment, students will explore the biological process of bacterial transformation using E. coli and plasmid DNA. 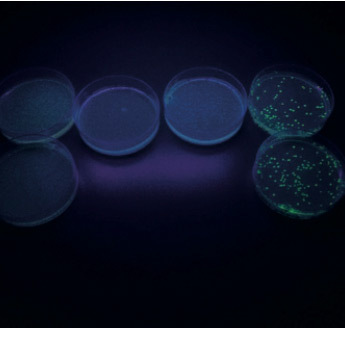 At the end of the activity, students will have experience observing and analyzing acquired traits (ampicillin resistance and fluorescence) as exhibited by transformed bacterial cells. 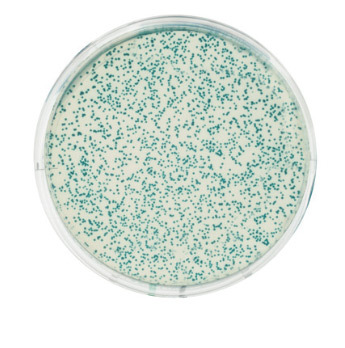 BactoBeads™ E. coli GFP Host, supercoiled pFluoroGreen™ plasmid DNA, ampicillin, IPTG, CaCl2, Growth Additive, Broth Agar, Broth Medium for Recovery, petri plates, plastic microtipped transfer pipets, wrapped 10 ml pipette, toothpicks, inoculating loops, microcentrifuge tubes. Automatic micropipette (5-50 µl) and tips, two waterbaths (37ºC and 42ºC), thermometer, incubation oven (37ºC), pipette pumps, ice, marking pens, bunsen burner, microwave, hot gloves, long wave UV light. Transformation es of central importance in molecular cloning since it allows for the selection, propagation, expression and purification of a gene. Positive selection for cells containing plasmid DNA is accomplished by antibiotic growth selection. 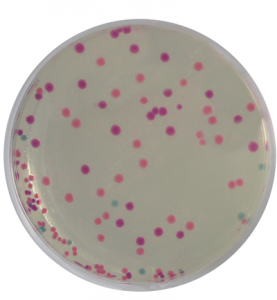 In this experiment, your students Will transform bacteria with a new set of rainbow color plasmids that transform non-pathogenic bacterial cells into bright, colorful cells. BactoBeads™, plasmid DNA, IPTG, transformation solution, ReadyPour™ Agar, Luria broth, ampicillin, petri dishes, sterile pipettes, loops and microtubes. Automatic micropipette (5-50µl) and tips, two water baths (37˚C and 42˚C), incubation oven, thermometer, pipette pumps or bulbs, ice, marking pens, hot plate or microwave oven, and hot gloves. When DNA is subcloned in the pUC polylinker region, ß-galactosidase production is interrupted, resulting in the inability of cells to hydrolyze X-Gal. 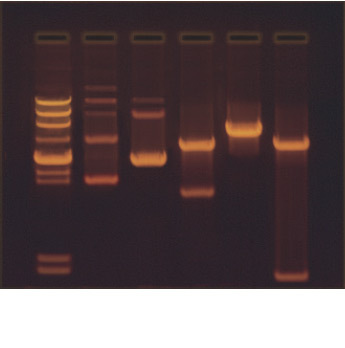 This experiment provides a DNA fragment together with a linear plasmid and T4 DNA Ligase. Following the ligation to synthesize the recombinant plasmid, competent E. coli cells are transformed and the numbers of recombinant antibiotic resistant white and blue colonies are counted. Finally ß-galactosidase activity is assayed from blue and white bacterial cells. This experiment can be broken down into three modules: ligation, transformation, and assay of ß-galactosidase. Linearized pUC plasmid & DNA fragment, T4 Ligase, BactoBeads™ for transformation, reconstitution buffer, XGal in solvent, IPTG, calcium chloride, antibiotic, Broth Agar, broth media for recovery, growth media, assay components, plastic supplies. Incubation oven, two waterbaths, shaking incubator or shaking waterbath, microwave or hot plate, micropipette and tips, spectrophotometer, balance, centrifuge, microcentrifuge, glassware and cuvettes, distilled water, ice. Cloning is frequently performed to study gene structure and function, and to enhance gene expression. This experiment is divided into five modules. Clones are constructed by ligation of a vector and a fragment insert. The constructs are then transformed into competent cells and the cells are grown and selected for resistance to an antibiotic. Plasmid DNA is then isolated from the transformants, cleaved with restriction enzymes, and analyzed by agarose gel electrophoresis. BactoBeads™, enzymes, plasmid DNA, restriction enzyme dilution buffer, enzyme grade water, standard DNA fragments, restriction enzyme reaction buffer, gel loading solution, agarose powder, electrophoresis buffer, stains, and calibrated pipette. Electrophoresis apparatus and power supply, automatic micropipet with tips, balance, microwave or hot plate, waterbath, large weigh boats for staining, UV transilluminator, floating racks for microtest tubes, pipette pump, 5 or 10 ml pipettes, laboratory glassware, metric rulers, distilled water, ice.